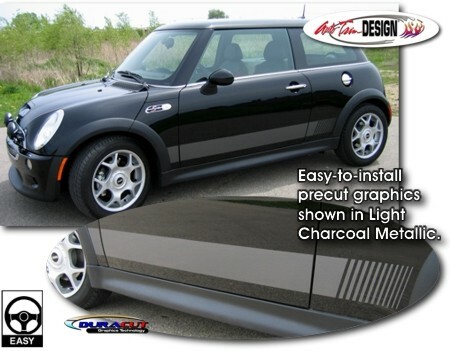 Dress up your '02-Current Mini Hardtop or Convertible Mini with this awesome "Strobe" design body side graphic kit! These graphics are precut and ready to install - NO TRIMMING required! Available in a wide variety of colors, they'll look great! Each stripe is 5" (127mm) in height and is set for installation approximately 2" (50.8mm) up from the bottom of each door.